An exciting and instructive session for museums, heritage sites and craft makers, this session will offer insight into how craft can tell a cultural story and how makers and visitor destination sites can make use of craft to enhance the visitor’s experience. Join Keynote speakers Joanne Kaar from Caithness, Scotland and Pam Hall from St. John's at the Manuels River Interpretation Centre on Wednesday, February 24. 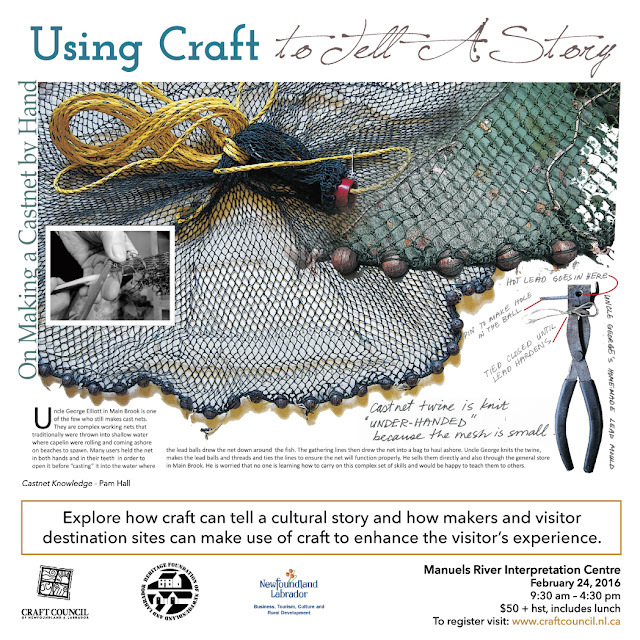 Presentations will be followed by panel comprised of local experts in storytelling and the craft industry. The panel will explore ways in which Newfoundland and Labrador craft makers, artists and designers are using craft to tell their stories. This is a collaborative project between the Craft Council Of Newfoundland and Labrador and the Intangible Cultural Heritage office of the Heritage Foundation of Newfoundland and Labrador. Your fee of $50 + HST includes lunch!